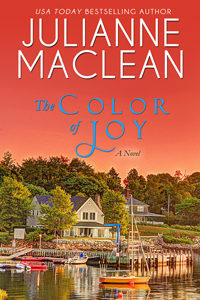 The Color of Joy is USA Today bestselling author Julianne MacLean’s eighth instalment in her popular Color of Heaven series, which has delivered many happy sighs to thousands of readers worldwide and left them clamoring for more. Bring tissues and prepare to be up all night reading this fast-paced, emotionally charged tale about the obstacles we encounter in everyday life and the real life magic that helps us to triumph over them. After rushing to the hospital for the birth of their third child, Riley and Lois James anticipate one of the most joyful days of their lives. But things take a dark turn when their newborn daughter vanishes from the hospital. Is this payback for something in Riley’s troubled past? Or is it something even more mysterious? As the search intensifies and the police close in, strange and unbelievable clues about the whereabouts of the newborn begin to emerge, and Riley soon finds himself at the center of a surprising turn of events that will challenge everything he once believed about life, love, and the existence of miracles. "MacLean delivered another emotional, edge-of-your-seat, deeply felt story. I intended to start the book at night and then finish it the next day, but the story flowed so easily and the suspense was so riveting that I found myself finishing it in one sitting."